Opening Song: My Hands Say Hello. When doing a new song with a new group, I'm careful to sing slowly and clearly to give the kids a chance to learn the words. They love to sing along and will try, so make it easier on them to hear what you are saying and learn the words. Singing is one of our five early literacy practices - it helps kids hear that words are made up of smaller sounds. 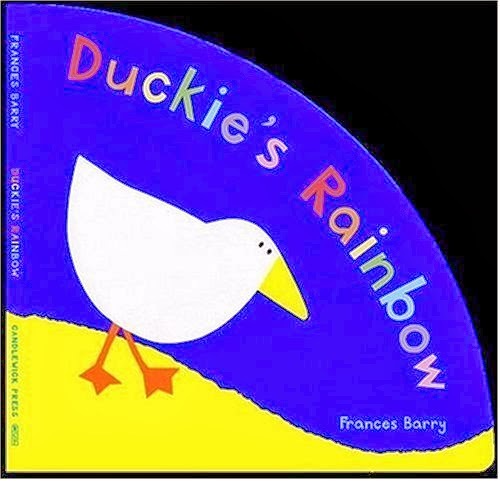 Book with Scarves: Duckie's Rainbow by Frances Barry (Candlewick, 2004). I was inspired by this post on Thrive Thursday: Using Scarves with Stories and decided to break out our colorful scarves for this one. I passed out the scarves to the kids (remember: you get what you get and you don't throw a fit) and then as I read the book, I asked the kids to wave their scarves when we got to their color. At the end, we all waved scarves together to make our own rainbow and then we scrunched them up and threw them into the air! To put our props away, I called them up by color and let them put their scarf in the bag. This makes putting the scarves away part of our game! This activity reinforced color knowledge and helped them practice listening and following instructions, both school readiness skills. The book Duckie's Rainbow is a short book, but contains lots of great vocabulary words like "poppy", "waddled", "hurried", "indigo" and more! Books are a great way to expose kids to words they may not hear in normal conversation, and it's easier for kids to learn to read words that they know! The pink one went outside, then there were four. The yellow one went outside, then there was one. The purple one went outside, and that was all. We talked about the rain in the last book and the rain outside yesterday. I asked the kids what we need to take with us when it rains and they chorused, "UMBRELLAS!" and then we did this rhyme! Hearing rhyming words helps kids hear that words are made up of smaller sounds. In this rhyme, we also practiced counting down from five. 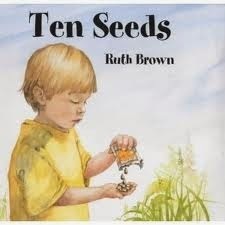 Book: Ten Seeds by Ruth Brown (Knopf Books for Young Readers, 2001). I wanted to include a book that would show plants growing and this was a great choice. At the beginning, a boy plants ten seeds, but as they start to grow, things happen to our seeds. An ant carries one away, a mouse eats another, a slug destroys a seedling, a ball crushes a plant... until we're left with one flower! I like this book because you can see the seeds start to grow roots and then the plants growing on each page. So they'll grow up tall! It was time to stand up and give the kids the chance to move a little bit and get some wiggles out, so we all stood up and did this song together. I went over the actions first (counting on fingers, fingers coming down for rain, arms above head for sunshine) and then we sang the song. We sang it twice since the kids were learning it the first time. Singing it again reinforces learning and gives the kids a chance to sing along with me. This song not only gave the kids a chance to move around a bit, it also reinforces science knowledge - plants need water and sun to grow. Using their hands to make the movements helps develop fine motor skills. This is a prop that Miss T made. It uses magnets to hold and move the kites around. I believe she got the idea from a presentation by Susan Dailey. And it got stuck there! 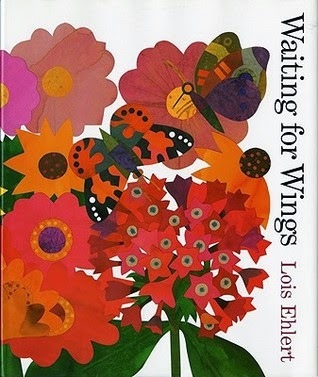 Book: Waiting for Wings by Lois Ehlert (HMH Books for Young Readers, 2001). This book takes us through the life cycle of a butterfly, from tiny eggs sticking to plants through caterpillars and chrysalises to new butterflies... who also lay eggs. The rhyming text contains lots of great vocabulary words. This was also another opportunity to have a STEM conversation. The kids already knew a lot about butterflies and they were happy to share with me. Here's another chance to reinforce science knowledge and help kids learn about the world around them. This is our typical closing song, to the tune of "Do You Know the Muffin Man?" and one of the kids asked me afterward if I know the song "Do you Know the Muffin Man?". We use a closing song to indicate to the kids when our storytime is over. They're familiar with the song if they've been to the library before and they know this is the end of our storytime routine. For a group visit, when we've sung our last song I tell them that now it's time to be good listeners and listen to their teachers who will tell them what to do next. This is not only closure for the kids, but it's closure for the teachers. They know that I am done with what I was doing and it's okay for them to take over and instruct the kids again. This was a great group and we had a blast!